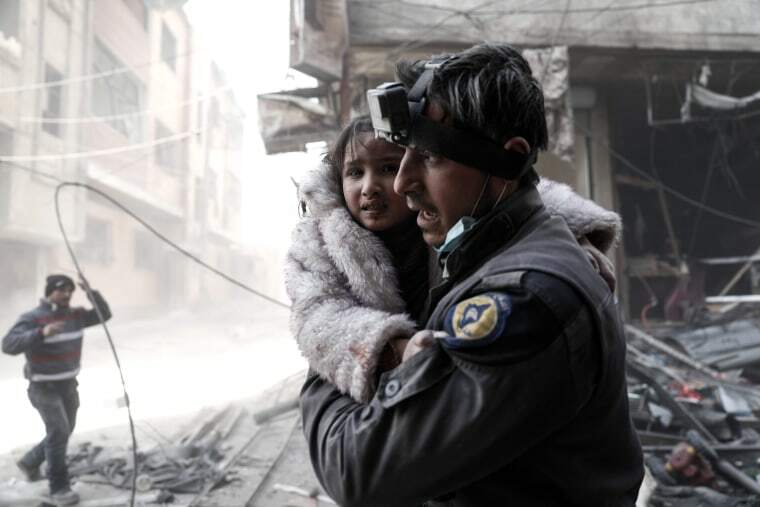 LONDON — The Israeli military has evacuated hundreds of members of Syria’s White Helmets civil defense group and their families from the country's southwest, as Russian-backed government forces close in on the area and continue to gain ground across the country. Jordan’s Foreign Minister Ayman Safadi said 422 White Helmets volunteers were evacuated, instead of the initial 800 cleared for the operation, according to the Associated Press. The evacuation was part of an international plan to help rescue the group's volunteers and was agreed upon at the NATO leaders’ summit in Brussels last week, Chrystia Freeland Canada’s Minister of Foreign Affairs said in a statement released on Saturday. Volunteers and their families were evacuated to neighboring Jordan after they were “besieged in a dangerous area,” Raed Al Saleh, director of the White Helmets posted on Twitter Sunday. "They are now being assisted by the UNHCR in Jordan pending international resettlement,” Britain's Foreign Office said in a statement on Sunday, referring the United Nations' refugee agency. The volunteers are expected to stay in Jordan for up to three months before being resettled in Britain, Germany and Canada, Jordanian Foreign Ministry spokesman Mohammed al-Kayed said Sunday. "The request was approved based on pure humanitarian reasons," he said, adding that the civilians will stay in a "closed area" for the duration of their transit through Jordan. A spokeswoman for the U.S. State Department said the United States welcomed the safe evacuations. "The White Helmets have consistently been targeted by the Assad regime," spokeswoman Heather Nauert said in a statement Sunday. "Members of the group, more than half of which are children, were allowed entry into Jordan on a transit basis, until UNHCR completes procedures for their resettlement in third countries." "We renew our call on the Assad regime and Russia to abide by their commitments, end the violence, and protect all Syrian civilians, including humanitarians such as the White Helmets, in areas formerly part of the southwest de-escalation zone and throughout Syria," she said. The German Interior Ministry said it would offer protection to eight White Helmet volunteers and their families. Neither Canada nor the U.K. has confirmed how many people they will take. The Israeli military said it acted on a government directive to evacuate the civilians at the request of the United States and “additional” European countries. “The transfer of the displaced Syrians through Israel is an exceptional humanitarian gesture,” it said in a statement released late Saturday. The military said its actions did not reflect a change to Israel's non-intervention policy in Syria's war, now in its eighth year, where all the warring parties are considered hostile. Israeli Prime Minister Benjamin Netanyahu said Israel would continue to act against "Iran's military build up" in the country. "Several days ago President Trump approached me, and the Canadian Prime Minister Trudeau and others asked us to help remove hundreds of White Helmets from Syria, who saved lives and were now in mortal danger," Netanyahu said in a statement Sunday. The White Helmets, officially known as the Syria Civil Defence, is a humanitarian organization made up of nearly 3,000 volunteers who work to save lives and rescue victims from the rubble of the country’s civil war. They have received backing from the U.S. and other Western nations for years, and are likely to be targeted by Syrian forces as they retake control of the southwest, according to officials familiar with the plan who spoke to the Associated Press on condition of anonymity. "Canada, working in close partnership with the United Kingdom and Germany, has been leading an international effort to ensure the safety of White Helmets and their families,” said Freeland. The evacuation took place from an area of Syria along the border with the Israeli-occupied Golan Heights where the volunteers were trapped. It is the last sliver of land outside government control in the region. The Syrian government, backed by Russia, continues to gain ground across the country. Last week it raised its flag over the city of Daraa, where the first protests against President Bashar Assad broke out in 2011, plunging the country into a devastating civil war. Secretary of State Mike Pompeo had a telephone conversation with Russian Foreign Minister Sergey Lavrov Saturday, during which they discussed the fact that Russia has violated its commitment in southwest Syria, State Department spokesperson Heather Nauert said Sunday. The White Helmets have continued to receive U.S. support despite President Donald Trump’s decision to withdraw all American forces from Syria as soon as Islamic State forces are defeated. In June, the State Department freed up a small portion in frozen funding for Syria stabilization programs to keep the White Helmets operating through the end of this year. But the White Helmets are not without controversy. They only operate in opposition-held areas, where government services are almost non-existent and aerial bombings are recurrent. Syrian government supporters accuse them of being politically affiliated with the rebel groups. In other parts of Syria, where government control has been restored, civil defense volunteers have been evacuated to other opposition-controlled areas. Associated Press, Paul Goldman, Lawahez Jabari and Reuters contributed.